‘Floating and Sinking’; that well-known chestnut of primary science experimentation. I suspect this is one experiment that many teachers dread, for fear of flooded classrooms, sodden literacy books and angry parents demanding to know why little Tarquin has come home with a soggy jumper. To be fair, this is wholly understandable- it takes more than a faint heart to give 30+ children carte blanche with tanks full of water! However, it really is worth avoiding the concomitant temptation to make floating and sinking experiments entirely teacher-led. In my experience, trusting the children (and telling them that you are trusting them), along with clear ground rules, really do pay off, and if you make the experiment interesting and pacy enough, most children shouldn’t need to resort to splashing. if you can find one, a fishtank is good to use at the front of the class, for ease of viewing through the clear sides (chat to the caretaker, most schools seem to have the relics of a failed aquarium somewhere). However, the disadvantage is that they are very heavy and awkward to move when full of water. A cheaper, easier and still effective container is a basic clear plastic box, the kind that staffrooms/store cupboards are full of. (I temporarily emptied out some Spanish resources to pinch the boxes for an afternoon). It’s good to get as many as you can of these, my personal preference is to have 4 or 5 groups with a ‘tank’ each. This means they can all see, all get chance to have a go, and hopefully stay more engaged. If you’re really not sure about having several tables running the experiment at once, this could be a one-group-at-a-time activity . Many KS1 classrooms have a water tray, KS2 classrooms could even try to pinch one of these for a lesson. 2) a heavy rubber ball, about the size of an orange. Plasticine is a great material to use for floating and sinking, and to introduce surface area/density. A small, dense ball of plasticine sinks, but a boat or raft shape will float; as an extension, let the kids investigate the different shapes – what will they have to do to make it float? Why does it work? So, we’re left with our orange conundrum. Next, take a single segment of orange and ask the children if they think it will float or sink. As it is smaller, and part of the same fruit, most will predict that it too will float. Drop it in, and watch the perplexed faces as it sinks! Get the children talking about what the differences might be, and why a smaller object sinks when the bigger one floats. A next step is to give the children an orange in each tank and ask them to make it sink. They will see that even holding it under water doesn’t make it sink for long, as each time it bobs back up. They should hit on the idea of peeling it and segmenting it. Can they work out what the most important thing they did was? You could demonstrate how the peel works by putting a ball in a rubber ring – it’s essentially the same effect. 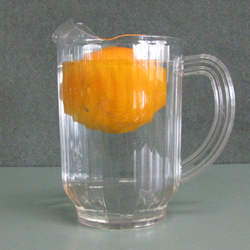 As a further extension, you could even give each group a whole, peeled orange and see if they can get it to float again. we did this immediately after the plasticine boats experiment at a science club, and it was really interesting to see them synthesise their knowledge. Some children tried to place it on a boat or raft, some tried to spread the surface area by segmenting it and then placing it on a raft, while others tried to make a plasticine ‘peel’ for the orange. All of the ideas were valid, even if they didn’t work, and all the kids were having great’ science talk’, a key facet of the new curriculum. Well, Autumn hasn’t officially started yet, but here we go! These first few weeks of the Autumn term are interesting ones, the interface between the fading summer and the oncoming crisp golden-ness of October making for some great wildlife-watching opportunities. Already the days are starting to have that September chill in the air, and soon the numbers of insects will be diminishing. There are several species of butterfly still to be seen ‘on the wing’ into September and October, and in fact these are some of our most colourful and familiar. 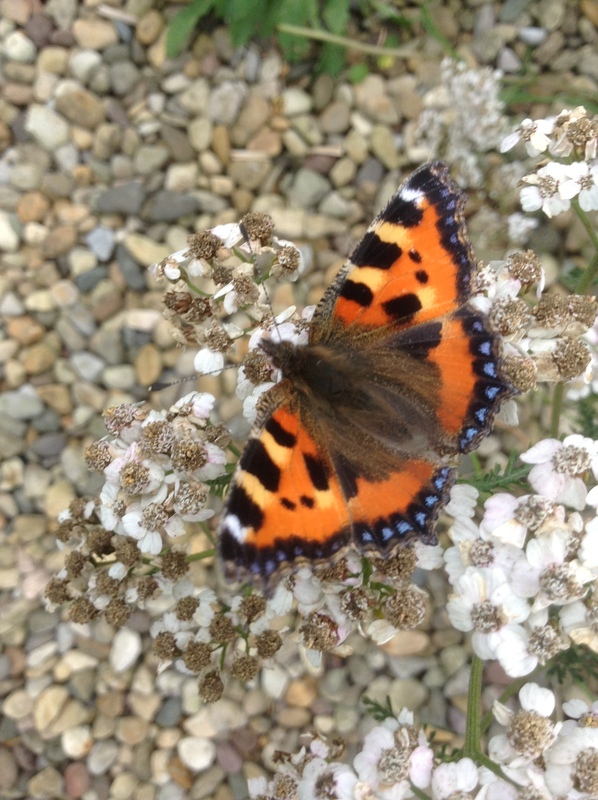 Today we are highlighting a well-known and popular species, the Small Tortoiseshell. One of the most colourful species of butterfly to be seen in Britain, the Small Tortoisheshell is widespread throughout the country. Partly, this is due to the wide availability of its foodplant, the common stinging nettle. However, in recent years it has become significantly less common, with recent studies citing as high as 52% decreases in some areas. There is some speculation that this is because of the spread of a parasitic fly, Sturmia bella, whose eggs are laid on nettle leaves and then ingested by caterpillars. You can read more about a study into this here. On the bright side, the butterfly seems to have enjoyed a good summer this year, no doubt boosted by our scorching July! There are two broods of the species each year. Adults hatch in July and August, and can survive not only our Autumn, but winter as well. Although you probablyt won’t see them, they are one of the few species that hibernate, in sheds, outbuildings and eaves of buildings. On warm February days you might be startled to find one of these overwintering specimens flying around your house, having woken prematurely! The overwintered Tortoiseshells are some of the first butterflies to be seen each year, and breed again in the Spring. 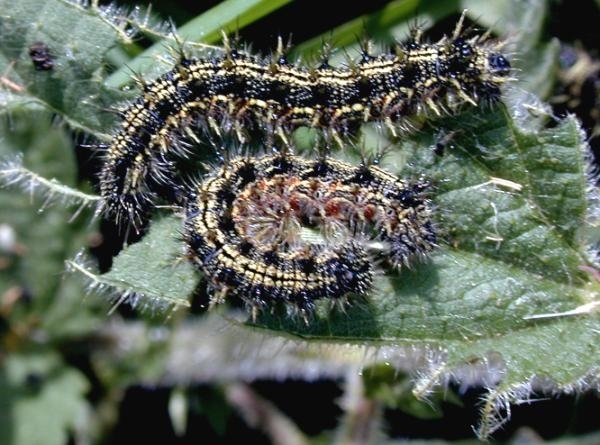 Small Tortoiseshell caterpillars – coming to a classroom near you? The Small Tortoishell is a great species to use in class supporting life cycles. Caterpillars are easily bred in captivity, and fresh nettles are easy to find to top up their food supply; it’s a great one to rear in your classroom, and the butterflies can be released anywhere. The organisation WorldWideButterflies provides special school rearing packs (as well as lots more) here, which are available from September. Obviously, this sort of project provides lots of great learning opportunities. As well as purely Science objectives, you could work in literacy themes of explanations (the life cycle), instructions (how to care for the caterpillars), as well as poetry, descriptive writing and so forth. As well as learning opportunities, there is the potential to help boost wild stocks of a species not as common as it was. Did you know that the Small Tortoiseshell has a much rarer relative? 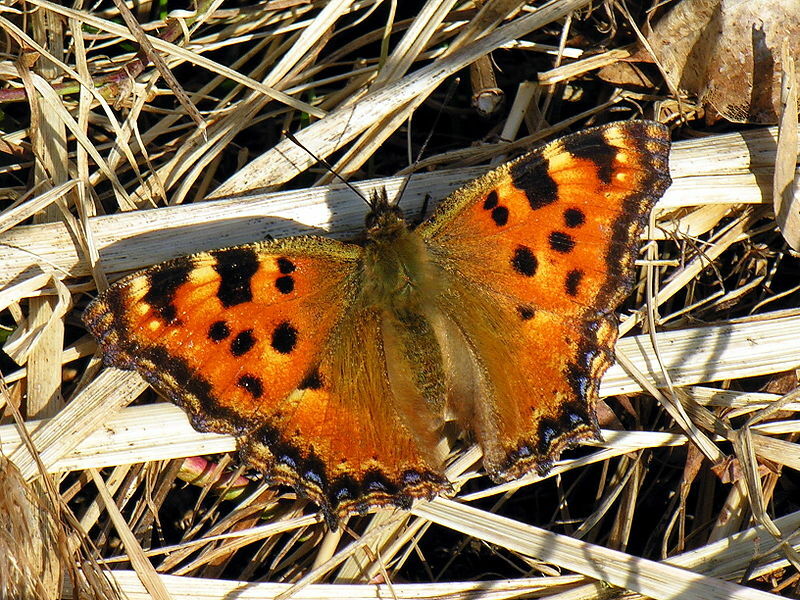 The Large Tortoisheshell Nymphalis polychloris, is superficially similar, but a paler orange and, you guessed it, larger. It once lived alongside it’s smaller cousin in the U.K., but has been declared extinct here for a number of years. Partly this was due to its more specialised needs; the caterpillars fed on elm trees, much less common than nettles. It hasn’t been seen for certain since the 1950s, although there are hopes for a comeback in the Isle of Wight. We’ve mentioned plants a lot lately. With the topic coming up in Y1, 2 and 3, it’s important to make sure that lessons don’t get too formulaic, or similar, so that children’s progression and interest are maintained. I thought I’d share some of the work produced by children in a recent Y3 lesson. This could be a starting point for a lesson tackling the new focus on classifying and identifying plants. 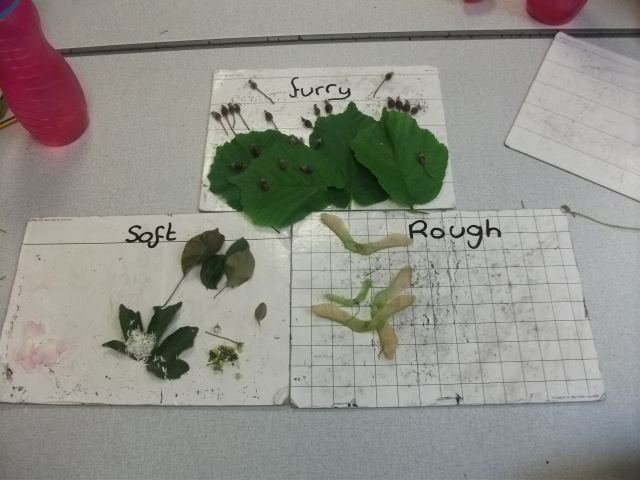 Giving the children chance to explore and use their prior knowledge about plants gave a good insight into how they needed to progress, rather than simply covering the same ground again. While sorting plants could sound like a fairly dry topic, simple things like having real plants and giving children freedom to explore them can really make a difference. We were blessed with a nice day and access to school grounds with a good variety of plants – shrubs, trees, grass and flowers of several different species. I started the session with the children sat in the circle on the grass, and quickly explained that I wanted them to collect any examples of plants that they could find. It’s a good idea to check beforehand to see if there are any thorny/stinging plants around so that you can warn the kids and set boundaries of areas to avoid. After they had collected an array of leaves, shoots, seeds and flowers, we went inside. I then gave them free time in groups to sort what they had collected. I left this as an open-ended task – the parameters for grouping were entirely up to the children themselves, giving plenty of opportunities for science talk. The groups they came up with were interesting, often based around tactile adjectives. 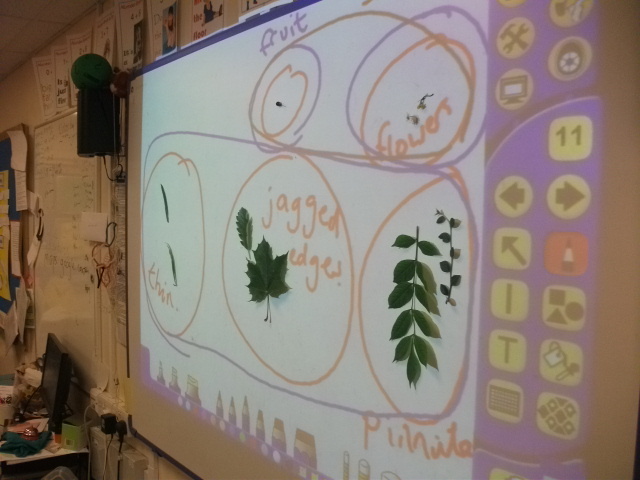 Higher ability groups thought to sort them into groups based on different parts of the plant – flowers, seeds, leaves etc. Interestingly though, even the less scientific groupings tended to be grouped this way by proxy. In the pictures above, for instance, ‘ones that fly’ and ‘rough’ ones, equate to seeds, while leaves are smooth. Seeds and flowers were small, but the leaves collected tended to be bigger. With some thinking time and a few leading questions from me, all the children were able to realise this. This got some good questions flying around: why are seeds rough? Why are they dry? Why are the leaves bigger than the flowers? The above nicely led us into the fact that there are many different ways of grouping the plant parts, and that they fit into more than one group. I modelled this on the whiteboard, using my plant samples and some double sided sticky tape. The different colour pens show that different samples can belong to different groups, or more than one group. From there, we led into producing dichotomous keys, which start from a simple point and gradually group more specifically. The children had a go at producing their own keys for their groups. I gave them ID guides for some of the leaves to enable them to write example names in – the example below includes holly and sallow leaves. Giving the children a chance to explore and find their own examples made them feel like experts. There was plenty of room for scientific talk, ‘working scientifically’ and the opportunity to raise questions for our future learning. 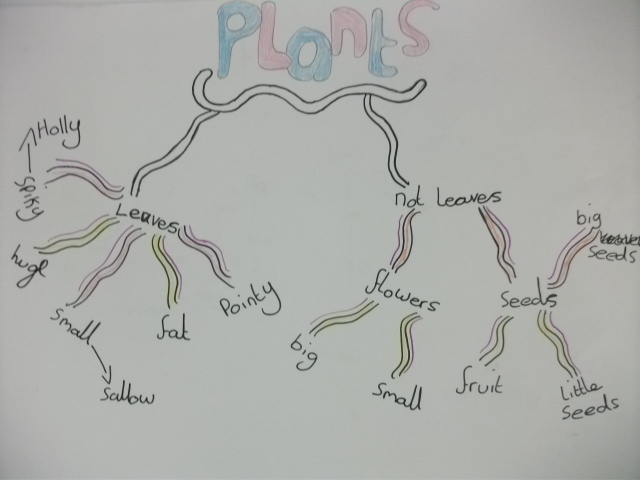 They were able to revisit previous knowledge of plant parts, and take this further by classifying and identifying some of the plants. By the end, even the boys who had initially groaned “but plants are boring” were asking what we would be learning about next lesson. As we continue with our plants lessons in the next couple of weeks, I’ll upload some useful resources such as tree ID guides. Following on from the last post, here is a summary of what the draft curriculum proposes for Y2. This is one of the years to see the most change. Two of the most well-established units, ‘Forces and Motion’ and ‘Using Electricity’ have seen major changes and abandonment, respectively. What you can see, across the whole curriculum, but especially here, is an attempt to simplify the titles of units. This is seen at all levels, from the division of all strands into ‘Biology’, ‘Chemistry’ and ‘Physics’, down to individual unit titles. Instead of QCA unit titles like ‘Plants and Animals in their Local Environments’, we now have ‘Plants’, ‘Animals, including humans’ and ‘Habitats’. Speaking of those strands, in Y2, you will notice a big focus on Biology. The elevation of habitats to an autonomous unit will give lots of opportunities for engaging learning and out-of-classroom opportunities. This is always one of the most interesting topics for the children, so the increased focus will be welcomed. (We’ll be providing plenty of resources to go with this and help you get the most out of habitats). As Biology dominates, the clear loser in Y2 is Physics. The ‘Using Electricity’ module is now gone entirely, with nothing to replace it. The simplification of topic titles has had a large impact on the former ‘Forces and Motion’ unit, now rechristened a plaintive ‘Movement’. Incredibly enough, all mention of the word ‘forces’, or even reference to pushes and pulls are airbrushed from the content. Of course, teachers can still mention these in context, but it does seem one of the more curious omissions in the entire curriculum. But I digress. This post isn’t here to debate the perceived rights and wrongs, just to make clearer what has actually changed. As yesterday, here is a grid showing the Year 2 curriculum changes. In the coming week, we’ll deal with what the new curriculum has in store for KS2. Watch this space! 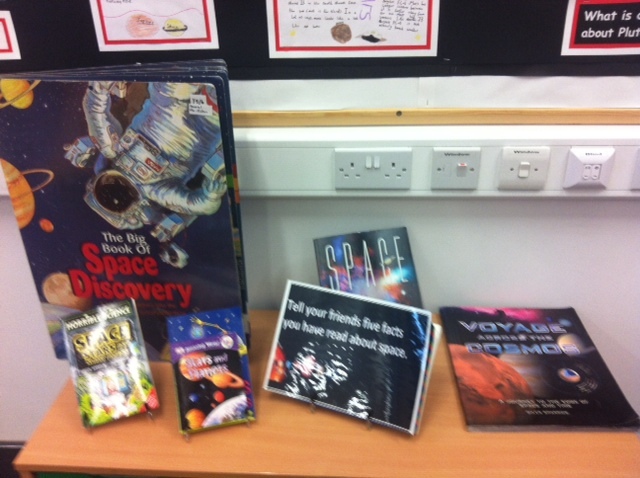 This post will cover a recent Space topic delivered to Y5. The topic included; the planets of our solar system, relative sizes and distances of the Sun, Earth and Moon as well as the orbits of the Earth and Moon. We will focus on key parts of the topic here. The above picture shows the display for this topic and as you can see it includes visually stimulating pictures, questions, children’s work and books for them to look through. Children are encouraged to bring in items from home to add to it and can be rewarding using whatever system you have going; team points, class currency etc. Two of the books in the above picture belong to children and one child brought in a piece of meteorite although this wasn’t on display at the time this photo was taken. To hook the children into the topic, they were introduced to it as a ‘space explorers’ returning to earth after investigating the universe. The video used showed space starting from deep space and heading towards Earth. This really engaged the class at it used space’s ‘awe and wonder’ features nicely. To increase pupil’s scientific thinking it is best to get them to see things for themselves. This undoubtedly raises some issues for space and until NASA launches school trips into space we need to improvise. A successful, interactive session for space was to use different sized objects to represent the Sun, Earth and Moon; I displayed a selection of spheres including a beach ball, football, tennis ball, small bead and blue tac as small as possible. Because not all schools have beach balls, a football could represent the Sun which means the Earth would have to be a small bead and the Moon would be the tiny piece of blue tac. 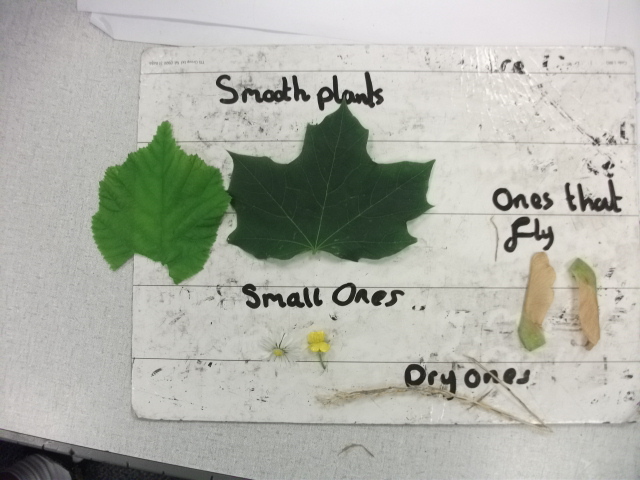 The children had fun discussing these differences and then sending the volutneer ‘Sun’ out of the classroom door and 12m from our volunteer ‘Earth’ to show its relative distance. Another interactive session was ‘plasticine planets’ where the children, after an input on orbits, were put into groups and demonstrated orbits using plasticine balls, string and pins. This was a challenging activity but they all managed it with regular learning stops, asking everyone to look at particularly successful groups. LAPs were asked to demonstrate the Earth’s orbit around the Sun, AAPs were asked to demonstrate this AND the Moon simultaneously orbiting Earth. The HAPs were challenged to explain how we get varied seasons and given Ipads with model solar systems on to research this. The above work was my favourite piece of assessment showing the children’s understanding of relativity between the Sun, Earth and Moon. After the practical lesson on the relative sizes and distances, strips of paper were given out; A4 cut into thirds, long ways. 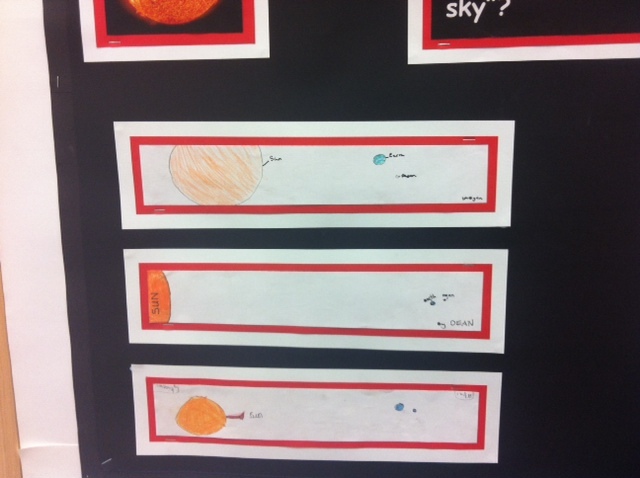 The children were simply asked to show what the Sun, Earth and Moon looked like in space. As you can see from the pictures above, you get an idea of which children understand that the Sun in much larger than both the Earth and Moon and how close they are relative to each other. It’s also important to set questions that make the children think and learn for themselves. 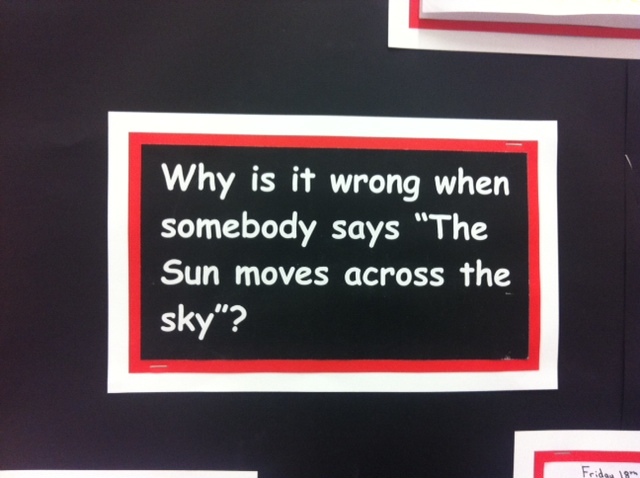 The above question challenges pupils to investigate what the Sun does if it doesn’t ‘move across the sky’. 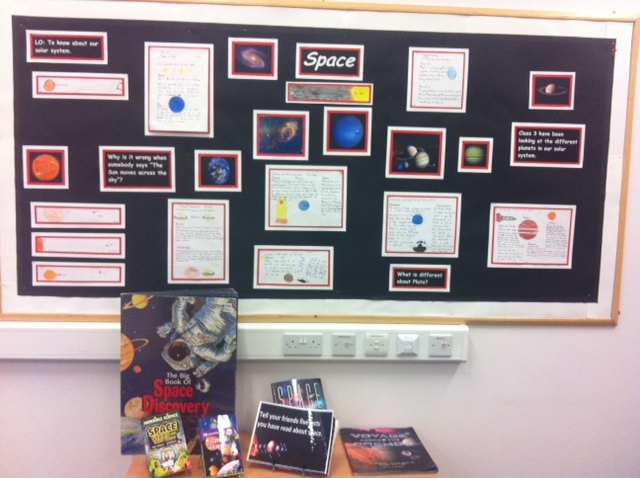 This post was an overview of the space topic taught to Y5. A more detailed description of each session will, in time, be added to our resources section so if this post interested you then keep your eyes peeled for the resources or if you can’t wait, request more information below. A person who is studying of one or more of the natural or physical sciences. Think of it that way, and all school children are, if given the opportunity, scientists. By extension, any adult who shares in their learning and questioning of the primary curriculum with them is a scientist as well. Chances are, if you’re reading this, that’s you. Investigating magnets, looking at different kinds of animal, pond dipping, comparing rocks; if you’re looking at it and questioning it – ‘working scientifically’, in the words of the new curriculum – you are a scientist. Well, yes, quite. The new draft curriculum is incredibly heavy on subject knowledge. Year 1 children identifying Willow and Horse Chestnut trees. Year 3 children picking out sedimentary from igneous rocks. Year 4s giving examples of speciation. There’s a heck of a lot of knowledge for kids (and teachers) to get their heads around. Recently, I attended a course run by a former headteacher and lead Ofsted inspector. She said that “subject knowledge is one of the biggest obstacles to outstanding science lessons”. Despite all this, we really do feel that if you have the inspiration and the curiosity, there are plenty of opportunities to pick up the subject knowledge. And that’s where the Primary Scientists blog comes in. Already, on the internet, this subject knowledge is floating around, waiting to be snapped up; there are so many great resources out there from specialist organisations. Often though, you need to do a bit of digging for them, and frequently these resources aren’t accompanied by any really creative ideas to aid their use. At Primary Scientists, we aim to make it all a bit more digestible and inspiring. We want to highlight what is useful and engaging. We will compile some of the best resources, and share our own ideas and experiences of actually using them in the classroom. We’ll add our own humble voices to the reams of subject knowledge, along with our own stories, thoughts, resources and photos. Anything on this site will be free to use. All we ask is that you share us with your friends and colleagues, and maybe give us the odd re-tweet. Speaking personally, we are scientists with degrees and conservation experience. As primary teachers, we are scientists too. Our aim is to blend both of these aspects to bring subject knowledge and curiosity to your classroom via useful ideas, resources, lesson plans and tidbits of information. Most of all, we want to pass on our excitement for the sciences and sharing them with children. Us. You. The children we all teach. Together, we are Primary Scientists.